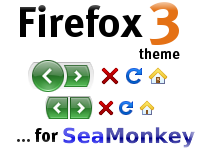 This theme brings the look of Firefox 3 to SeaMonkey's browser interface. The default SeaMonkey interface, while maintaining many aspects of the Firefox 3-style theme, retains significant differences such as different icons (and icon sizes), different tabbar look and feel, etc. With this theme installed and the Firefox 3 look and feel restored, you will be able to get the very nice user interface experience that was provided by Firefox 3, in SeaMonkey! That means a comprehensive browser chrome with nice, colourful icons. The default icons have been restored to their Firefox 3 equivalents, based on the Windows ('winstripe') version of the Firefox 3 theme. The rest of the SeaMonkey interface by and large stays the same, so new functionality added to SeaMonkey should be able to blend in well with the main Firefox 3 look and feel. I want to keep this theme bug-free, so please feel free to contact me if you have any bug reports or display glitches. You can download/install this theme from the Mozilla add-ons site.